New Orleans is a wonderful walking city and offers convenient, cheap and totally fun streetcars as an option for getting from neighborhood to neighborhood. It's easy to do without a car if you're not on a road trip to the Crescent City. But many visitors find themselves needing a taxi now and then in addition to getting to and from the airport. A quick run from the French Quarter to the famous Mid-City Lanes Rock 'n' Bowl, for example, is best accomplished by cab for expediency's sake. But in New Orleans, taxicabs are not controlled by a central dispatch, and they are hard to flag down except on busy hotel-heavy stretches in the French Quarter and Central Business District. So how on earth do you find one? Well, you just pick up the phone and call when you need them or reserve online or with an app, for the most part. The largest and oldest taxicab company in New Orleans is United Cabs; these look bizarrely like police cruisers. They are the standard go-to for hotel concierges and restaurant hosts and the like. This is the best company to call if you're in the Central Business District, downtown or the French Quarter. Call dispatch and you'll usually have one within a few minutes. There are quite a few other choices, but they most often only serve certain neighborhoods. 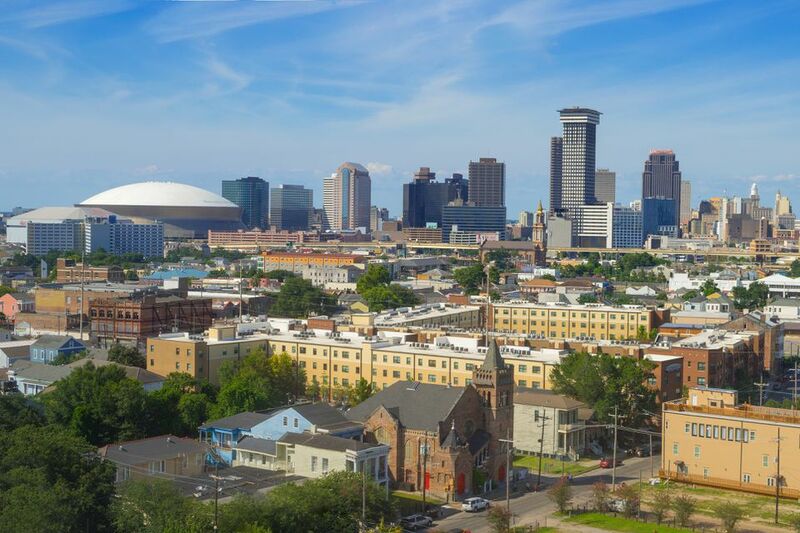 You have an abundance of choices for Uptown, the Garden District, and mid-city. For the cost of your ride, use a handy fare estimator for New Orleans. At Louis Armstrong New Orleans International Airport or the bus/train station, instead of calling a specific taxi company, you'll just stand in the taxi queue on the lower level near the baggage claim. A taxi from the airport to the French Quarter or CBD costs around $36 for one or two people or $15 per person for three or more people. Tipping: 10 to 15 percent is standard, 20 percent for exemplary service or heavy luggage. Uber is also available in New Orleans. It is often comparably priced to cabs, and many users say they find the service somewhat more reliable plus easier to use, given the convenience of the app. If you use the app on your phone in your home city, it'll work the same in New Orleans. If you don't, consider downloading it in advance of your trip; it's not a bad option to have on hand. Note that Uber surge pricing is always in effect from the airport, so cabs tend to be a cheaper option there.